I miss the Union of Soviet Socialist Republics. I really do. Watching the Olympics in Sochi, as I am here and there, reminds me of this. Oh, there are plenty of things I don't miss. 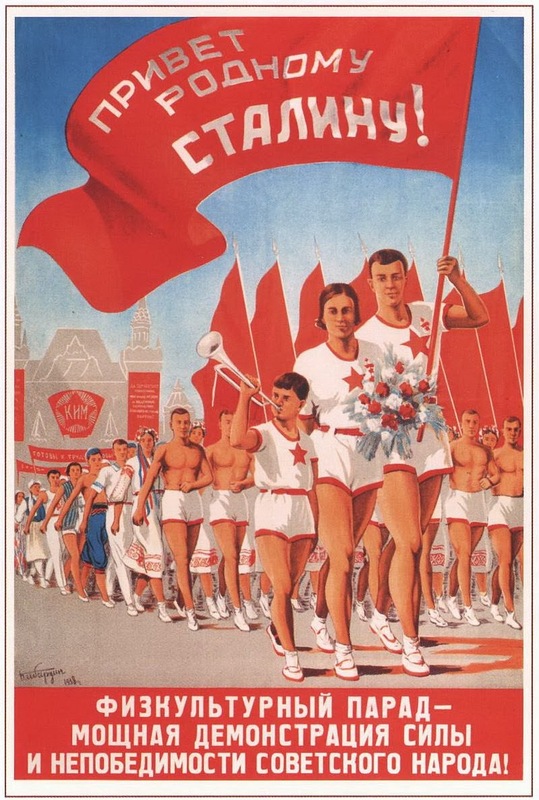 I don't miss the brutal oppression of the Russian people under the Soviet regime, and the hard hand turned against the peoples of the USSR's satellite states. In many ways, I don't need to miss it, 'cause it's still there. Czar Vladimir has proven himself quite capable of maintaining that dark old habit. I don't miss staring down the barrel of thousands of Soviet ICBMs. That was the stuff of so many childhood nightmares, the kind of pointless, species-ending absurdity that only glazed-eye ideologues could embrace. But I do miss the pretense of Communism and Soviet Socialism, because America needed it. Our society has grown notably weaker and more dissolute since the fall of the Soviet Union, as the darker demons of capitalism are let play. Why is this happening? Because suddenly, there's no competition. And I miss the competition, because as the Olympics show us, competition makes us stronger. Who is holding us to our ideals? If we claim to be a free nation, founded on principles of justice and equality, who's poking us in the eye if we treat a particular group like they're just a little bit subhuman? Who goads us to excel and challenge ourselves, stirring us to reaching a strong arm up into the heavens and stand on other worlds? Nobody. And if we claim that capitalism provides wonderfully for all, and yet it clearly ain't, who's providing a potent...false, but potent...apparent alternative? Our current enemies, such as they are, offer us nothing desirable. The Taliban? Al Qaeda? Who would wish to be them? Cold, ugly, backwards, ignoble, and hateful, there's nothing about their worldview that would appeal to the vast majority of human beings. North Korea? Lord have mercy. But the Soviets did things. Badly, often, but they did. They felt like they were giving us a run for our money, and they drove America to suppress the darker demons of capitalism and to strive. We're better than that, we'd say, and we were right. We made sure we were right. Oh, sure, correlation isn't causation, but I'm reasonably sure it's a nonrandom thing that the cradle-to-grave care provided by America's businesses vanished like a morning fog the moment the Soviet Union collapsed. It's a nonrandom thing that American CEO pay has soared to Russian Oligarch levels since communism sputtered out and died. Back then, no executive or Senator would have wanted the average American looking to the Rooskies and saying, "You know what, this whole mess is terrible. Maybe them Commies ain't all wrong." But now, now that we're all living in Potterville, stressed out and working two-dead-end jobs without benefits, up to our eyeballs in debt while we struggle to figure out how we're going to pay for the Xanax we need just to keep it together? Now, there's no-one there to rub our noses in it. Which is a real pity. Because Khrushchev, as it turned out, was wrong. They weren't going to bury us. We're managing to do that ourselves.